When you make Cheesy Sausage Bombs three times in 2 weeks, and you still want more…You know you are on to something! Geez-oh-man! How could something so simple be so ridiculously crave-worthy? My 15 year old son Connor is obsessed with these packets of man-food, and the best part?? These are so easy he can whip them up himself! Last week I was tinkering around with Hatfield Essentials Ground Sausage for “Game Day” recipes and decided to wrap pizza dough around a mixture of pan-sauteed sausage and mozzarella cheese. The result?? 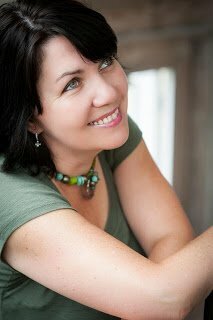 My family went bonkers (and I was scarfing them down as I attempted to shoot the photos). 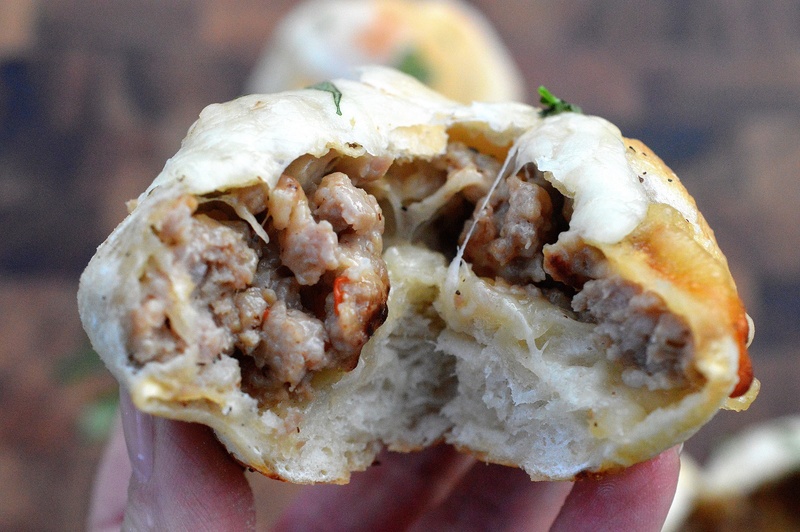 I mean…warm crusty-pillowy pizza dough with cheese and sausage? 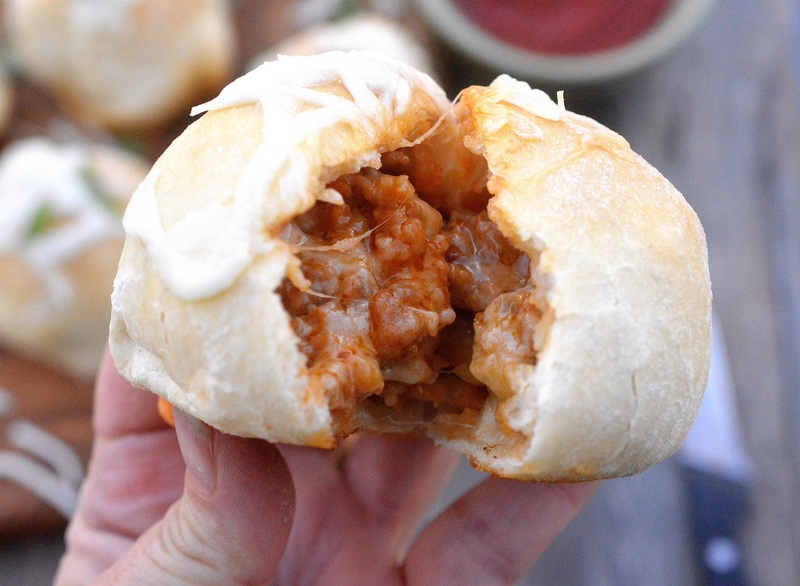 These Cheesy Sausage Bombs are like…take a bite, chew really fast so you can take hurry up and another bite as soon as possible…delicious! 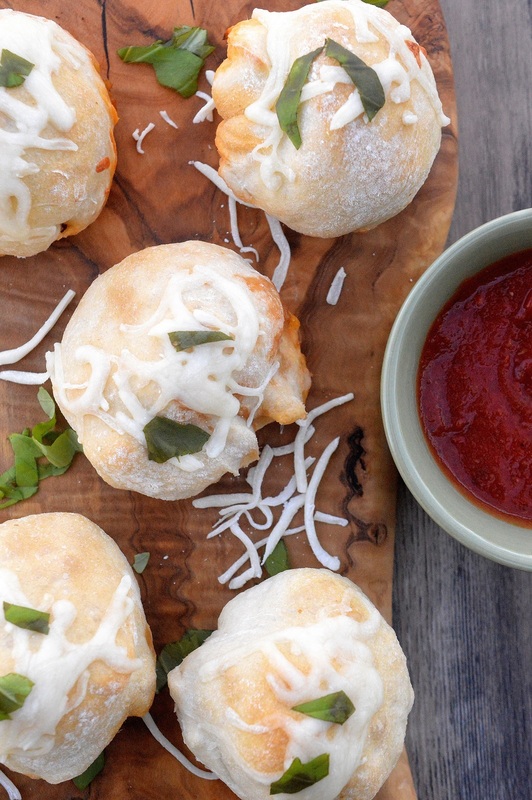 These Cheesy Sausage Bombs are the perfect Game Day food! Thanks to Hatfield Essentials Ground Sausage they come together in a snap. No need to remove casing from sausage (win!!). 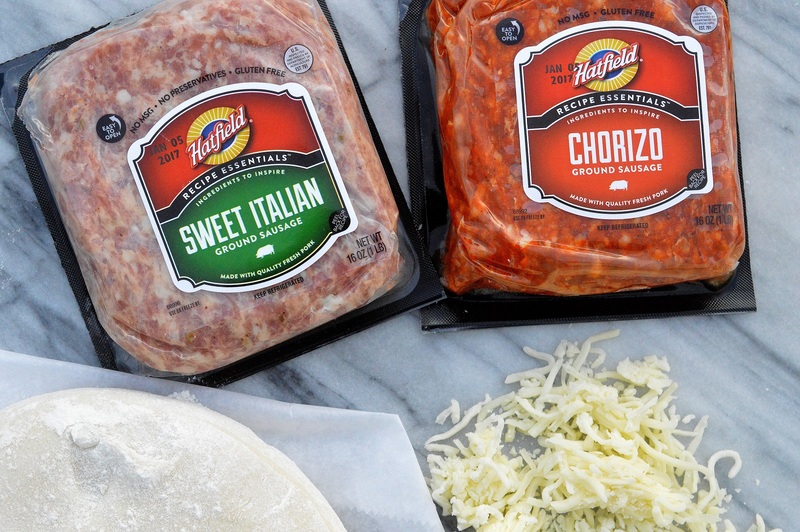 I love that Hatfield Quality Meats sells Ground Sweet Italian, Ground Hot Italian Hot, Ground Pork, Ground Pork with Sage Country Ground Sausage and Ground Chorizo Sausage in their Recipe Essentials Product Line. 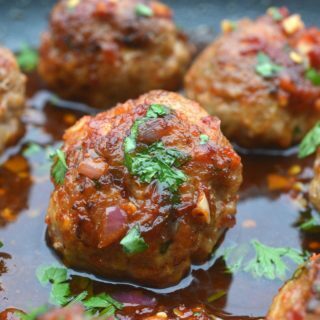 Whether your making these little “bombs” of deliciousness, stuffing mushrooms or making chili (love sausage in my chili)…Hatfield Quality Meats makes it easier! 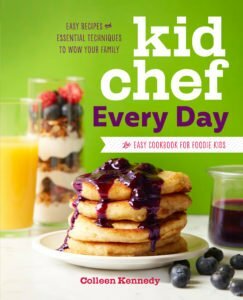 I love partnering with them on recipes, they have so many quality products so the ideas are endless! 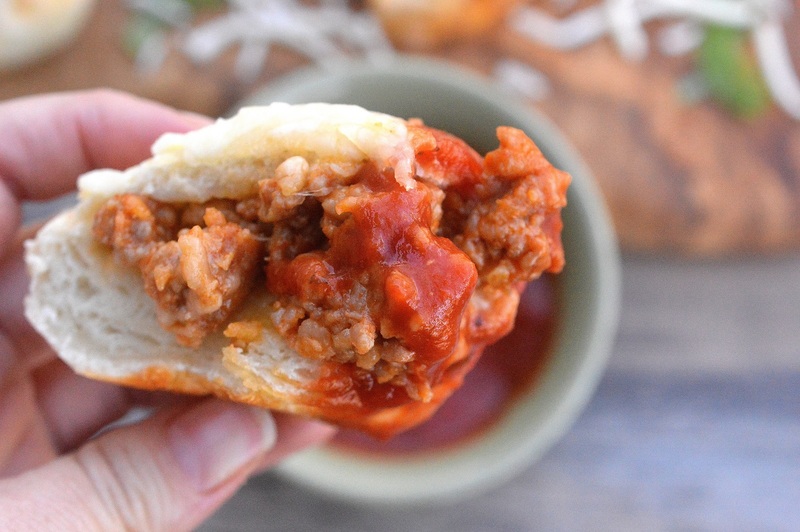 If you want to dip these Cheesy Sausage Bombs in some pizza or pasta sauce…Go for it, that’s how my husband likes them…the rest of us like them as is. You could make these with some sauteed peppers and onions, yummo! I have said this about 20 times across my blog over the last 6 years…As much as I love to cook and bake, I never make my own pizza dough. It’s just one of those things that I leave to the experts. In my case, my local pizza place who has the best dough ever! They charge $2.50 per disc of dough. I have no mess, no wait time and just by popping over, I can make whatever I want to with dough on a whim! 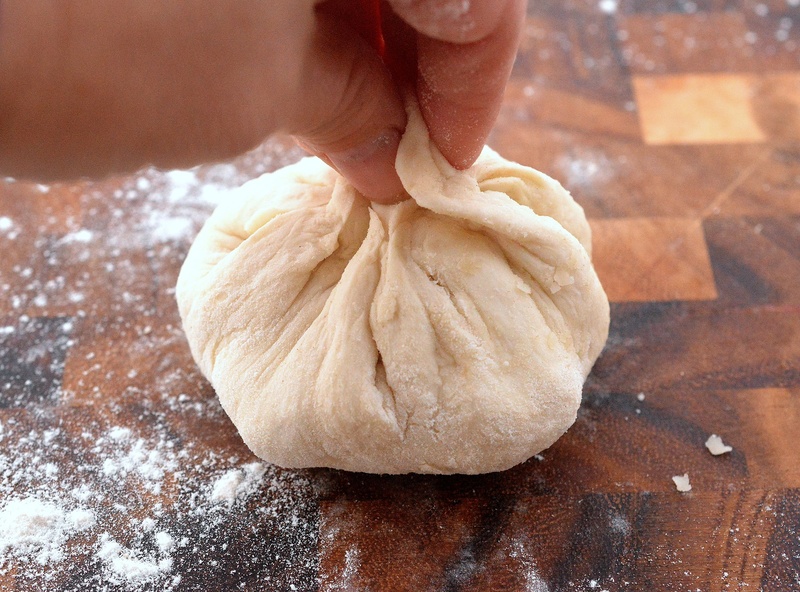 Here’s how you pinch these Cheesy Sausage Bombs closed…See below. It’s almost like a big soup dumpling/ The trick is to ensure that each of your little bundles are sealed. Then flip, and bake on a baking sheet until golden. Make these with sweet sausage or hot sausage. We enjoy them both ways…(Below is a sweet sausage pic…see the color difference) If you have sweet sausage but enjoy a bit of a kick, simply add in some red pepper flakes. It seems in my house all but one of us feel the spicier the food is, the better! I struggled to get across in photos just how good these are…which may be why I have so many images, which is not typical for me. They may not be the prettiest food on my website, but they are one of the most delicious! I hope you try these Game Day Cheesy Sausage Bombs! I’d love to see your version if you do. Tag me on Instagram, Twitter or Facebook @SouffleBombay. Thanks again to Hatfield Quality Meats for partnering up for this deliciously easy Game Day Recipe! Saute sausage in a non stick frying pan until 85% or so cooked through. Drain grease and add in Mozzarella. Allow mixture to cool 10 minutes or so. Roll out your pizza dough until the disc of dough is the size of a large pizza pie. Cut into triangular or square pieces four to four and a half inches across and high. Plop sausage mixture into the center of each piece, add and extra pinch of Mozzarella for extra cheesiness. Fold edges up, pinch firmly, twist shut then flip the "bomb" upside down on an ungreased baking sheet (seam side down). make sure the package is fully sealed. Repeat until all dough/mixture is used. Bake at 400 degrees for 15-20 minutes or until crust is golden brown on top. 2 minutes before removing from the oven, take the tray out and sprinkle extra cheese over-top if you choose. You could also, lightly brush each with oil before you do that and season with some black pepper and Kosher Sausage. Then once out of the oven, scatter some fresh Basil or Parsley over-top...Your call. 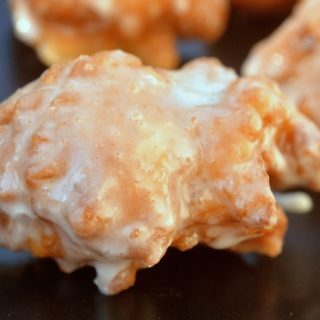 Make these as plain or fancy as you like, either way they will be delicious. 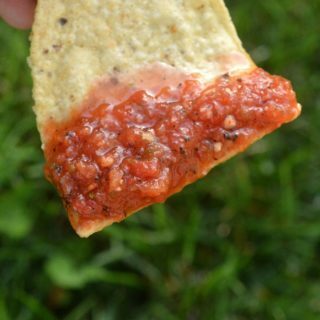 Serve alone or with a bowl of pizza sauce for dipping. 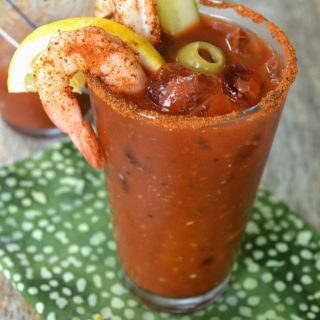 What a fun recipe for game day! No wonder your son loves these so much. And how cool that they’re so easy to make he can make them! I love all the melted cheese on top…perfect for a game day party, Colleen! I could totally snuggle up with several of those!! They definitely love crave-worthy to me! And looove that there’s Italian sausage in there! These would be gone in no time around here!! ooo sweet heavens I need these in my life asap! I’m totally make these for the super bowl. Love the simple ingredients! Holy YES PLEASE! I’ve got to make these STAT!